China is building a base in the disputed Spratly Islands for an advanced rescue vessel complete with drones and underwater robots. Chen Xingguang, political commissar of the ship, said the ship is scheduled to be deployed in the second half of the year, the official China Daily reported on May 23. 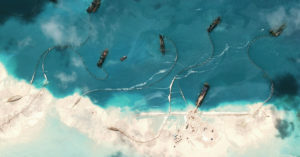 Chinese land reclamation work in the South China Sea. Beijing said the rescue ship base station would enable rescue forces to aid fishing boats in trouble, and shorten the distance they need to travel. China claims most of the South China Sea as its territory and has carried out land reclamation and construction on several islands in the Spratlys, parts of which are also claimed by the Philippines, Vietnam, Brunei, Malaysia and Taiwan. Washington has accused Beijing of militarizing the South China Sea after creating several artificial islands and constructing airstrips that can accommodate military aircraft. China has said it plans to continue building civilian facilities as well as “necessary military facilities”. The China Daily also reported that Beijing has constructed two lighthouses and four beacons in the disputed Paracel Islands and has set up four base stations for radio communications and civilian cellphone networks, providing “complete coverage of the area”. Meanwhile, the official People’s Liberation Army Daily said on its microblog that China’s South China Sea fleet carried out military drills in the western Pacific on May 21.